The following book review is written by teen contributor Alyssa Miller. Read her bio below. 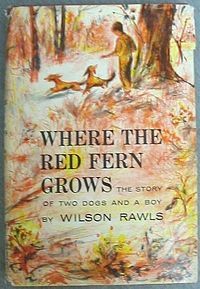 Where the Red Fern Grows is a novel by Wilson Rawls. The book is an inspirational coming of age story for any reader. The story begins with the main character, Billy, rescuing a redbone coonhound from a pack of the neighborhood dogs. When he does this, he revisits his past when he was just a young boy who wanted a good hunting dog. Unfortunately for Billy, the family cannot afford a dog, let alone a hunting dog, and definitely not two, but them then Billy spots an ad offering a pair of redbone pups for $25 each. Billy decides he wants those dogs bad enough to work for it on his own, and saves up that $50. His grandfather helps him out and sends off to get the pups, but the mail won’t deliver them to the area they live in, so Billy determinedly goes and gets his two pups, whom he later names Old Dan, and Little Ann. To say more would spoil this charming tale, but I will say that the book goes through every emotion possible, forcing you to feel the joy, sadness, and fear of Billy Colman. I am particularly impressed by how the author brings forward so much change in this young boy’s life, and shows how even through the worst of circumstances, people can still make it through. Alyssa writes a lot of short stories and political opinions, and finds writing about herself to be the most challenging. Her second passion is drawing. She almost always has something drawn in progress or something that she's thinking of drawing later. She has a very open mind, and she won't hesitate to listen to anyone's opinion, even if she disagrees. She has two cats and both enjoy covering Alyssa and her belongings in their fur, so she will apologize for her lack of a lint roller. Alyssa I agree with you 100%. Where The Red Fearn grows is a must read. On a side note, I think you have a bright future as a writer.